...... can be external or internal, the rollover and click features are programmable, and it also has a callback feature for each event which will allow you to create animation or effects linked to the menu. Key features: -Editing Software and Component included -Add incredible special effects -Full customizable buttons library -Menu are quickly loaded by browsers -More than 40 FXs, custom links (8 types) -If you need: Easy integration with ASP/PHP/.NET -Horizontal-Vertical-Free Position styles -Any number of custom sub-menus -Multiple menus on the same FLA -Information, free buttons, free sounds and more -Build menus in under 3 minutes!. Full Customization. -No ActionScript is needed to build your menu! Is an all-in-one, easy-to-use, templates-based Flash Menu Building software. Navigation button for menus with rollover and play sounds, etc. Flash-producing design tool for creating flash web menu on web pages. Qweas is providing links to QS Flash Magic Menu Builder 1.0 as a courtesy, and makes no representations regarding QS Flash Magic Menu Builder or any other applications or any information related thereto. Any questions, complaints or claims regarding this application QS Flash Magic Menu Builder 1.0 must be directed to the appropriate software vendor. 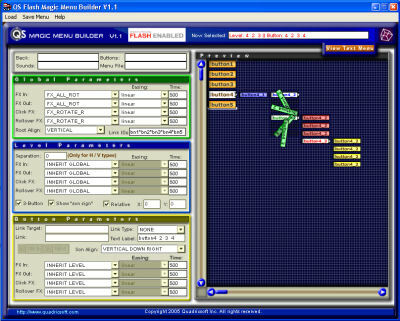 You may click the publisher link of QS Flash Magic Menu Builder on the top of this page to get more details about the vendor.